"134 degrees Fahrenheit?" quizzed my son, Steen. The Death Valley National Park ranger reiterated, "Yes! And that was the air temperature measured in the shade, making it the second highest ever recorded (136 degrees was once recorded in Libya). The ground temp was 20l degrees!" Fried eggs or boiling water for tea, anyone? Summer vacation in hell? Death Valley is well named if traveling and vacationing in the searing doldrums of summer. However, the remainder of the year it would be more appropriately named Life Valley. During the April day when Steen and I spoke with the ranger, the outside temperature was a comfortable 75 degrees. Earlier that morning we had walked from our Stovepipe Wells campsite to Mesquite Sand Dunes wearing jacket, hat and gloves. The night temperature in our tent had been in the cozy 60s. Death Valley National Park covers 3.4 million acres or 5,300 square miles, making it Americas largest national park outside of Alaska. It is a geological marvel of immense contrast, diversity and beauty. Standing at its lowest point, at an elevation of -282 feet, where snowfall has never been recorded, one can look up to snow-covered 11,049-foot Telescope Peak. 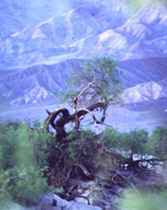 Death Valleys biotic communities extend from the lower Sonoran life zone (below sea level to 3000 feet), where rain is minimal and summer temperatures high, to the boreal life zone (over 8000 feet), where rain and winter snow are common. Such diversity makes for fascinating zones of discovery, adventure, and recreation. Nearly 1,000 species of plants flourish in the park, 21 of which are found nowhere else in the world. Numerous species of mammals, birds and reptiles populate the park with most activity concentrated around springs. Because of Death Valleys summer heat, most of the animals are nocturnal. When I begin to rust from Oregons long winter, Death Valley is the perfect escape trip in early spring. Traveling down fascinating Highway 395 in Eastern California, we turn onto Highways l36 and l90 toward Death Valley. Crossing the Panamint Valley Mountain Range, our first official stop is the quaint and charming oasis of Panamint Springs Resort, just inside the park boundary -- a great place for a cold drink and a home cooked meal. Panamint Springs Resort has an air of solitude in this isolated desert location, complemented by friendly folk and the homey touch of the true Old West. I feel like Im in a scene out of 1001 Arabian Nights when I stay here--the remoteness, a lingering suffusion of magenta in the early evening light, tamarisk and palm trees contrasting with the bleak landscape. Interesting side trips from Panamint Springs Resort include the old silver town Darwin and Darwin Falls, a beautiful waterfall hidden in a willow and cottonwood oasis. Our favorite place to camp is Stovepipe Wells, named for the stovepipes pounded into the sand to form walls for a well used by pre-automotive travelers in Death Valley. Stovepipe Wells was Death Valleys first tourist resort. Today there is a general store, gift shop, restaurant, gas station, swimming pool, Badwater Saloon, campground, and 82-unit motel. We set up a large tent with a screened porch that overlooks Mesquite Sand Dunes and the Amargosa Range. "Five star deluxe camping," Steen says. We open the large screened windows in the day hours, allowing a refreshing airflow, and also securely anchor our tent and equipment against a sudden windstorm. We love exploring nearby Mosaic Canyon, a spectacular slot of colorful, stream-polished marble breccia rock Rock-climbers can clamber up dry waterfalls and explore Tucki Mountain to possibly encounter desert bighorn sheep. Lizard life is abundant, including large chuckwallas, once a delicacy for the native Shoshones. These lizards run into a crevice and swell themselves up to prevent capture. My first chuckwalla experience was literally nose-to-nose while free climbing a Mosaic Canyon wall. It was a disquieting experience until I remembered that none of the Death Valley lizards are poisonous. However, be aware of rattlesnakes. I once accidentally stepped on the head of a Death Valley sidewinder. Some of the worlds greatest photographers, including Ansel Adams and Edward Weston, have trained their lenses on nearby wondrous Mesquite Sand Dunes. Early morning and late afternoon trips offer the best light and cooler exploration conditions. A unique time to explore is during a full or partial moon. 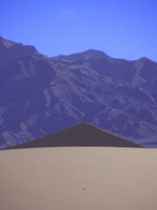 The desert dune landscape, surrounded by the abruptly rising mountains, is surrealistic, hypnotic. Ive met fox, coyote, owls and a variety of other critters on such treks. Scotty's Castle Less than 40 miles from Stovepipe Wells is the extravagant Moorish style mansion, Scottys Castle. It makes for an interesting day drive along with visiting nearby Ubehebe Crater  an extinct volcano 2,000 feet across and 750 feet deep exposing colorful marine sediments of the Paleozoic age. 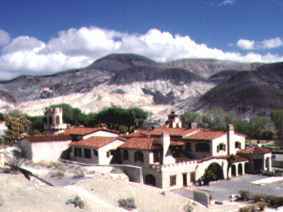 Scottys Castle was intended as the winter vacation home of Chicago millionaire Albert Johnson, but has become famous more for his colorful sidekick Walter Scott, or "Death Valley Scotty." Nestled in Grapevine Canyon, the grounds offer a fascinating glimpse into a bygone era and character. Furnace Creek is the closest thing to a town in Death Valley. 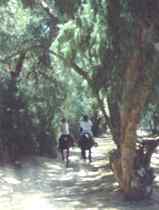 It has the Death Valley Visitor Center, the Borax Museum, and a full range of lodging, restaurants, and services, including horseback, carriage, and hay-wagon rides. While in Furnace Creek enjoy the 49er Coffee Shops great date shakes. 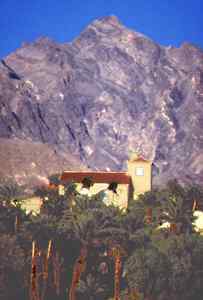 Furnace Creek is the ideal location from which to explore some of Death Valleys main geological attractions, all within 30 miles. Spectacular Dantes View is inspiring in morning light. Explorations in this zone afford incredible views of the sheer wall of the Panamint Range, with miles of Badwater salt flats below and the imposing Sierra Nevada Range to the Northwest. En route to Dantes View stop at Zabriskie Point where the sunrise highlights the hills with gold hues and contrasting shadows while the mountains across the valley subtly change from pink to blue-gray. Afternoon excursions from Furnace Creek should include Golden Canyon, three miles south on the Badwater Road, where late afternoon sunlight paints deep golden tones on the canyon walls, accenting the russet earth colors. American Indians once used red clay at the canyons mouth as face paint. 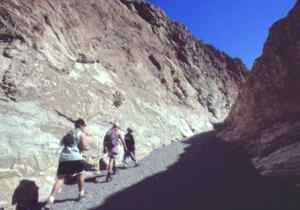 Walking trails lead to Red Cathedral, a large natural amphitheater, Manly Beacon, and Zabriskie Point. A one-way paved road off Badwater Road goes to Artists Drive with a rainbow of colors in the eroded clay deposits of ancient lakebed sediments. Artists Palette, halfway along the drive, also has an enchanting mosaic of hues -- red, yellow, black, brown, violet, green and saffron. Badwater, at 280 feet below sea level and l7 miles south of Furnace Creek, is the lowest point in Death Valley that is accessible to vehicles. The western hemispheres two lowest points, both at -282 feet, are three and five miles respectively off the road, northwest of Badwater. Make the hike to these spots in the late afternoon toward sunset. Springtime is the right time, as summer temperatures here commonly reach 120 degrees. 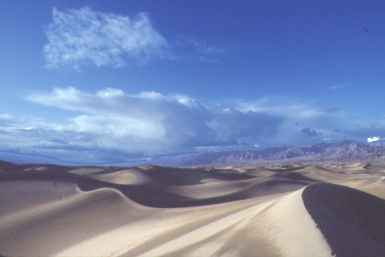 Click here for details to plan your own trip to Death Valley National Park.